The DBD22 is a dual block occupancy detector. It provides complete isolation from the track by using small transformer type sensors. This also means there is no drop in track voltage as there is with sensing diodes. The DBD22 is designed to work well with the SIC24e signal and indicator controller. Duty track can cause intermittent current flow. A built in filter keeps the DBD22 from rapidly turning off and on if the current flow is interrupted. Additional, there is a small amount of hysteresis so that small changes in track current near the trigger point do not cause the DBD22 to turn off and on. The filter keeps the output on after a train leaves the block for a short period of time. This time is typically about 1 to 2 seconds. The amount of track current has an effect on this time. 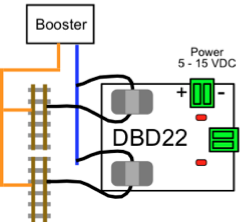 Since the DBD22 does not use diodes to sense track current there is no drop in track voltage. This allows you to “double sense” a block. For example, suppose you want to add a grade crossing with gates and flashers to a section of track that already has a diode sensing block detector. The block could be cut into three smaller blocks to detect traffic on each approach and island blocks. DBD2s can be used for the three new blocks with out interfering with the operation of the original detector or causing an additional track voltage drop. See the SIC24e signal and indicator controller for information on implementing a grade crossing.